This week marks the end of this column’s nineteenth year. 2017 was a busy and eventful twelve months for Cape Region golf. January—Dustin Johnson’s rules dustup in the 2016 U.S. Open leads to changes that should help other golfers. I begin several columns on the 2016 U.S. Mid-Amateur Championship held at Stonewall in Elverson, PA. Jim Klinedinst makes his second ace on the same course and same hole as his first hole-in-one almost two years before. February—The Mid-Amateur series continues. Chris Krueger is the new head coach of the Cape Henlopen High School golf team. Greg Thomas describes the challenges facing him as the new course superintendent at Rookery South. March—My interview of Butch Harmon at the PGA Merchandise Show in Orlando, FL centers on Cobra’s new golf clubs. The Cape Henlopen Vikings begin practice for the spring season. Several other companies are profiled from the 2017 PGA Merchandise Show, including the Greg Norman Collection and Sentio putters. The USGA and R&A issue draft Rules changes to soften some of the game’s harsher provisions. The Cape golf team wins its first match of the season. April—Cape defeats Laurel and loses to Caesar Rodney. The Vikings beat Delmar with a tiebreaker rule, and then win against Dover. Sarah Lydic wins third place in the national finals of the Drive Chip & Putt Championships at Augusta National. A bunker renovation project nears completion at The Peninsula. Cape wins three more matches, against Indian River, Milford, and Concord. Criquet and Devereaux apparel companies make appearances at the PGA Merchandise Show. May—The Viking win a rain-delayed match against Seaford. I test the new Antigua shirts from the PGA Show. Cape wins three more matches, against Woodbridge, Sussex Central, and Polytech. Rehoboth Beach CC superintendent Mike Maney discusses the club’s maintenance projects from the past winter. The Vikings win three more matches, against Delmarva Christian, Smyrna, and Sussex Academy, but lose to Sussex Tech. Anna Norqvist discusses her chances for a three-peat at the upcoming ShopRite LPGA Classic presented by Acer. Sawyer Brockstedt won several junior tournaments and will compete in the 2018 National Drive Chip & Putt Championship. June—The Cape golf team finishes fourth in the Henlopen Conference tournament, and ninth in the State Championship. Local golf clubs are well underway with their competition schedules for 2017. Kings Creek CC teaching pro Chris Krueger plays in the 2017 PGA Professional Championship in Oregon. Carnoustie golf holds onto cotton for one of its lines, which I appreciate. Three golfers make aces at RBCC in the space of five days. LPGA player Jackie Stoelting is the main source for a two-column series on the cost of touring. Cape Region junior golfers, led by Sawyer Brockstedt, do very nicely in the Philly Junior Tour series. 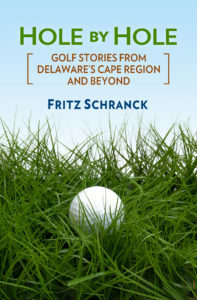 July—Nine Cape Region golfers make the cut at the Delaware Amateur. The Happy Putters from Brainstorm Golf offers two levels of adjustability. RBCC’s Black and Gold event raises $2,500 for the Children’s Beach House. Cellist Tony Gizzi makes his first ace at Rookery South, and three more aces are made at Rehoboth Beach CC. Sawyer Brockstedt wins the opening qualifier event for the 2018 Drive Chip & Putt Championship. August—Wilson’s new Triton driver is the result of a popular design competition. The new Gold tees at Rookery North are hugely popular. Sawyer Brockstedt continues her quest for the finals in the Drive Chip & Putt Championship. Chris Krueger finishes in second place overall and first place among the pros at the Delaware Open. September—Sarah Hyde starts college with the help of the 2017 Stephen R. Lett Scholarship. 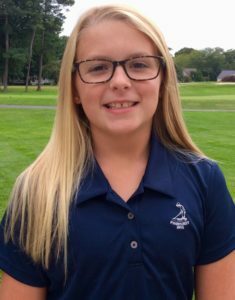 Sawyer Brockstedt goes to Pinehurst and wins the regional, qualifying her for the national finals of the 2018 Drive Chip & Putt Championship. Judy Wetzel wins the DSGA’s Super Senior Stroke Play Championship. TaylorMade describes the company’s new golf balls. Brett Marshall regrets the need to close the Ruddo’s Golf Store on Route 1. Local clubs begin winding down their seasonal competitions. October—Three young Delaware women take second place in the 2017 USGA State Team Championship in the competition’s final year. I discuss the lessons learned from playing the 2017 Delaware Senior Amateur. Watching LPGA players warm up before their rounds at the ShopRite LPGA Classic presented by Acer is a valuable lesson. Cape Region fall fundraiser events are part of a multi-billion dollar phenomenon. The season for posting for handicaps is stretched two more weeks. November— I run a three-column series on the 2017 ShopRite LPGA Classic presented by Acer. A fundraiser tournament at Rookery North brings in over $4,000 for the First Tee of Delaware. The turf at Rookery South makes a great recovery from the ravages of 2016. December—The annual Don’t Give Me Stuff for Christmas column leads with a headcover with the alleged likeness of our President. Rehoboth Beach CC is busy with a major irrigation and maintenance renovation project it hopes to complete by winter’s end. Plenty of local Christmas golf gift options are available. Congratulations to Heritage Shores assistant pro Zac Oakley for winning Event No. 6 of the PGA Tournament Series in Florida Dec. 19. The 2015 Delaware Open winner shot 65-67 at PGA Golf Club in Port St. Lucie for a two-stroke victory and another $5,000 check to go with the $5,000 he won Dec. 5 at Event No. 2. His $11,972 total for the six tournaments earned him second place on the Series money list.